It’s good to keep things positive, says Macleans College teacher Susan van der Spuy, when teaching science and environmental issues to children. Otherwise they can tend to think the whole planet is going to burn up. Mrs van der Spuy, who recently finished a placement at Landcare Research under the Royal Society of New Zealand’s Science Teaching Leadership Programme, gives a teacher’s perspective on preparing students to tackle an uncertain future. Is it difficult for teachers to include climate change issues in the curriculum? 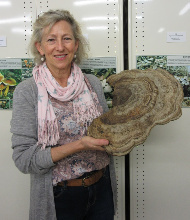 Susan van der Spuy holding a bracket fungus in the Fungarium at Landcare Research. It’s very possible. NCEA has the flexibility and primary and intermediate schools are able to teach contextually. We do a project with Year 9 about carbon footprints, which works well though it is reliant on parents being willing to supply the information. And with the Year 10s we do a global warming project – this is where you get the skulls and crossbones and the whole planet burning down. But if you don’t have a primary or intermediate teacher who feels confident it’s difficult, and you’ve got all the personal opinions – whether they believe in climate change or not. We’ve launched a teaching unit with Year 10s called Education for Sustainability where the students get out of the classroom and get involved in monitoring our local ecosystems, for example looking for plastic waste on the beach and doing stream water testing. For some teachers it’s fantastic but it’s interesting that even trained secondary science teachers don’t necessarily feel comfortable with the material or the environment. How do you combat the skull and crossbone scenarios? It’s important to keep things positive. 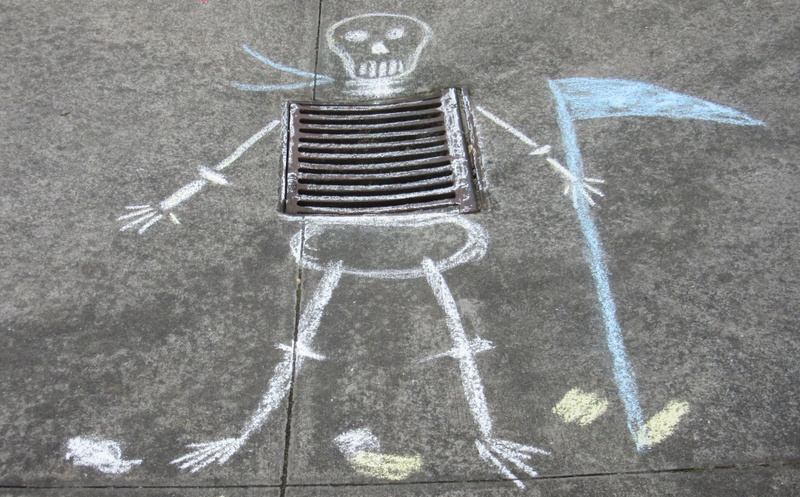 I work with Bridget Glasgow from Enviroschools and her attitude is to keep it positive and interactive by including music and drama where the kids present their findings along with possible solutions to problems. I also try to keep things local – and had this confirmed during the Science Teaching Leadership Programme. During my time at Landcare Research I was fortunate to come across Martha Munroe from the University of Florida who has developed resources for use in schools over there. Their group hooks environmental teaching resources on to something fundamental and local. So she developed this incredible resource with her PhD students relating to wild fires, and she shared it with me so that I can adapt it into something more relevant for New Zealand students. We could relate it to testing the seawater pH and levels in our local bay, for example. The Royal Society of New Zealand’s climate change document provides a valid user-friendly resource. Is the main difficulty that teachers need more resources? Teachers drown in resources; the difficulty is in choosing the best ones and making them relevant for our kids. At the end of the school day you’ve got meetings, so by the time you get home in the evening and you’re surfing the internet for ideas – it’s overwhelming. Getting kids out of the classroom is the richest way of learning, but that is getting more difficult with all the health and safety regulations. I don’t think the scientists at Landcare Research realised what an amazing experience I had, being able to go on all these field trips with them. We are fortunate at our school, however, because we can walk to the beach, and we’ve adopted our own reserve and stream. Peter Gluckman talks about having science champions and someone like Nanogirl works really well for the primary schools. For the secondary students, however, they seem to bond more with someone they can see more on an ongoing basis – we’re fortunate to have an inspiring woman from the Auckland organisation Wai Care who has been training students to measure stream health. Do external organisations provide enough to support to schools? Often the organisations are very disparate. We’ve got Wai Care, who are fantastic. Often such organisations work mainly with primary schools, whereas Wai Care have really understood how to step up their activities for High School students. But while there are many other initiatives, they are often dependent on funding and many little organisations only operate for a year or two. Others don’t have school engagement as their core business which means they might have little idea how schools operate. With the councils the left hand doesn’t always seem to know what the right hand is doing. Sometimes these bigger organisations might tell us they’re going to have an event this weekend, when we’re in the middle of exams, we’ve got sporting events on, or we don’t have time to get permission slips out. Alternatively emails don’t get to the right teachers. Planning and engagement would be easier if schools had a website to go to – maybe on the Science Learning Hub – which listed citizen science projects and other science activities in your area for the entire year. What else were you involved with during your time at Landcare Research? Fortunately my placement corresponded with the start of a Curious Minds project working with schools to identify new fungal species – only about a third of New Zealand fungal species have been identified. We worked with three schools and collected samples in pristine forests which students really enjoyed. Of course anything new wasn’t going to be a colourful mushroom, it was going to be small, but we did eventually discover some new species. It was a matter of diving in, though, doing this amazing science, and then diving out. All in all we saw the kids three times. As a teacher I saw all the potential for deep, rich learning, but it was up to the kids’ teachers to enhance outcomes in their own time. I did my best, making quizzes and worksheets and documenting processes on Facebook so the kids could follow what was happening with ‘their’ fungus. Effective teacher support is essential in order to provide the scaffolding required to get maximum benefit from participatory science projects as scientists’ time is costly and limited. We just spent an afternoon as part of our Enviroschools Facilitator Training Day in the Wellington Region – trying to nut out best approaches to try and support teachers in engaging with climate change – resulting in very similar thinking you have mentioned above. Would love to have this conversation with others. Great it is out there. Thank you. Although there is some research out there to support your belief that ‘keeping it positive’ is important, it is not overwhelmingly convincing. AND I can say I personally disagree A LOT with this sentiment -again, that I think is spreading wider than it’s empirical evidence warrants. I grew up in the Northern Hemisphere during the Cold War. For various reasons I have recently been reading back through my journals of jr high and high school. I, and my classmates, were exposed by 1-2 great teachers to then key contemporary books and films about nuclear war. They were terrifying. I most certainly, and many of my classmates, believed there was a very good chance we would see a nuclear war and we knew that we then could not expect to have much of a future at all. I expressed this many many times in my journals, wavering between fear vs just resigned deep sadness. BUT!!! The important thing is I , and many kids my age, also got motivated by that fear/sadness and anger and wrote petitions, wrote letters, wrote songs and made bands to sing them publicly, made art, marched, did demonstrations, etc. We got public, and got creative and we got noticed. It made me someone who acts (gets involved) now as an adult (and happily eventually there was disarmament and I have enjoyed a pretty good life/feeling of a future ). If we protect the kids from their justified fear and sadness and anger I FEAR we just grow their current and future apathy.